I have a Keet named Neon whose cagemate Ice sadly died from fatty liver disease back in August, and I know it's affected him. It's been tearing me apart, because we had to take Ice in to get his beak trimmed every month or so due to the disease's overgrowth symptoms, and he died from a heart attack just as they were finishing one time, and Neon saw that. While he's still a little outgoing and mostly 'acts' normal, he's much more scared of any movement and just not as brave. It still pains me greatly and causes a lot of regret. Since then, I've been trying all sorts of things to help him, and one thing is to get one of those plastic penguins on wheels. When I had a Keet as a kid, he absolutely loved the freestanding version. It seems though that the wheel version doesn't exist anywhere in the US. Doing an eBay search (https://goo.gl/G2mRj9), the only results that come up are from the UK and EXTREMELY expensive. Heck there isn't even anything on Amazon! Amazon has similar but it has pink wheels rather than red. Ehh date first listed only December 23 2018, a single review, and the company doesn't even have an Amazon page. Really dubious of that. We are based in Leicester, UK and have been a trusted Amazon seller for over 7 years. We supply over 100,000 products in 500 brands. At Pertemba we are committed to ensuring our customers are 100% satisfied with our products and customer service. Most orders ship in 2-3 days and delivery usually takes between 7-10 working days. It's less than $7.00 including shipping. Not much a risk if it's something you really want. Hi there, last week I received some of these penguins from a UK friend. I don’t have any with red wheels but I do have some black and white penguins with pink wheels. I’d be happy to send you a couple if you think your boy would like them. the 85% positive rating is referring to the seller, not the specific item. Yes, I'm aware of that. The point was that the seller has an 85% positive rating and the item is fairly inexpensive to order. Those are so cute. 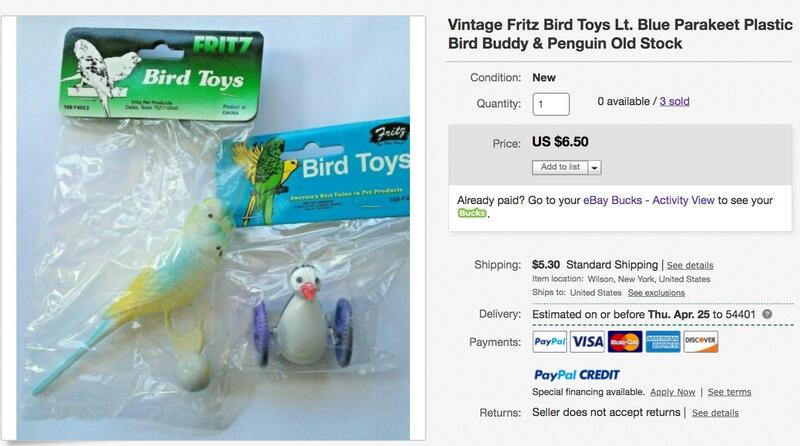 I used to love this toy for small birds. Be aware though, that it’s balanced with a weight inside that looks like lead. That was a long time ago when I saw it, but I’m sure they’re still made the same way. So only for very tiny beaks, and under supervision.